According to provisions of the Animal Protection Act "surgical operations on animals during an experiment or in the production of biological preparations may be carried out by veterinarians, medical doctors, pharmaceutical chemists, medical biochemists, doctors of dental medicine, experts in animal husbandry or biologists, provided they have passed the examination referred to in paragraph 1 of this Article. When a surgical operation referred to in paragraph 2 of this Article is not carried out by a veterinarian, the person responsible for the protection of animals must be a veterinarian." (Article 32, paragraphs 2 and 3). Text suggested by Animal Friends: "Surgical operations on animals during an experiment or in the production of biological preparations may be carried out by veterinarians provided they have passed the examination referred to in paragraph 1 of this Article. 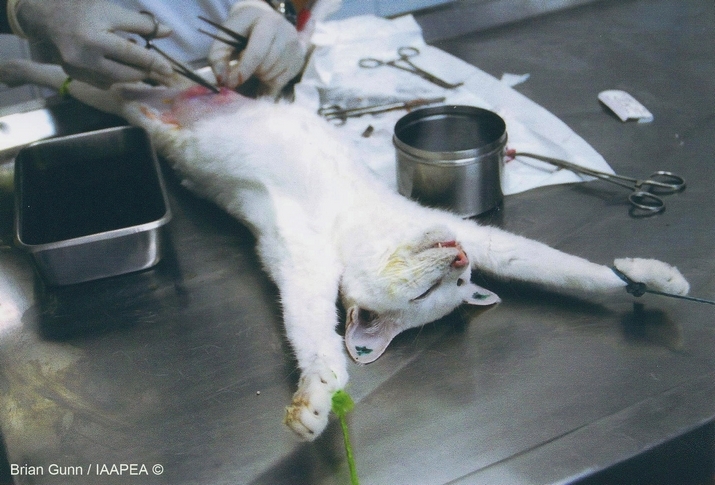 As an exception from paragraph 2 of this article, surgical operations during experiments on animals can be performed by doctor surgeons provided they have passed the examination referred to in paragraph 1 of this Article." Explanation: It is intolerable to have surgical operations on animals during experiments performed by members of professions who do not have expert education in surgery. We believe that surgical operations on animals should be performed exclusively by veterinary professionals and perhaps doctors that specialise in surgery. We don't see any reason not to change this practice in order to improve the Animal Protection Act. The provision about performing surgical operations on animals exclusively by veterinarians and doctors was already in the working version of the Draft proposal of the Animal Protection Act in 2006.